Derek Senft is a Partner in Frontline Real Estate Services. He acts as a Director on the Board, with a special focus on strategy, governance, and business development. Derek brings over 10 years of combined experience in private equity and investment banking to the Company, providing his expertise in managing small and medium sized, growing businesses. Derek has always been passionate about real estate. Through his private equity experience investing in and managing operating companies, he has been involved in a number of real estate sale and leasing transactions, and currently manages a portfolio of owned industrial properties. 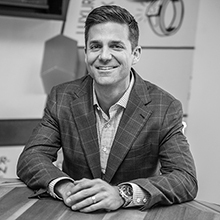 Derek has been a principal of Pender West Capital Partners Inc. since 2012, a family-backed private equity firm that invests in small to medium sized businesses. Here, he is an active Board member at Entertainment Partners & Canada Film Capital, as well as at Overland Container Transportation Services. Alongside his role at Pender West, Derek is a founding member of Tricor Pacific Founders Capital Inc., a family firm that combines 25 years’ private equity experience in over 75 companies with deep operating knowledge, focused on applying operating know-how in medium-sized food and other consumer packaged goods businesses. Previously, Derek spent four years working at Tricor Pacific Capital Inc., one of Canada’s largest institutionally-backed private equity firms. Prior to that he spent two years as an analyst in the Investment Banking division of CIBC World Markets. Drek received his M.B.A. degree from London Business School (London, UK) in 2012, and his B.A. degree from Dartmouth College (Hanover, NH) in 2003.